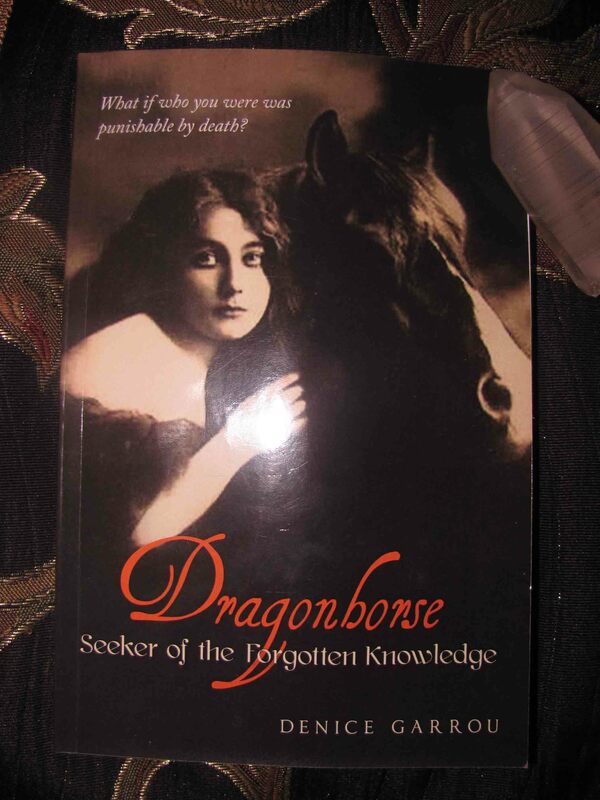 Today author Denice Garrou joins us and tells us about her journey in writing her latest fantasy novel, Dragonhorse and Seeker of the Forgotten Knowledge. When I was a small child, I had this strong feeling I was here to do something. Not just anything but something, like I had a job to do. I was a quiet, introverted child that spent most of my time reading Walter Farley books or drawing horses, since no one ever exposed me to J.R.R. Tolkien, who I am pretty sure I was in my past life. All kidding aside, there was a time in my life I did not have a horse and spent most of that time dreaming of owning one. Little did I know what the horse truly meant to my journey upon this earth? Once I was on my own and married with three daughters of my own, it was time to have horses once again. 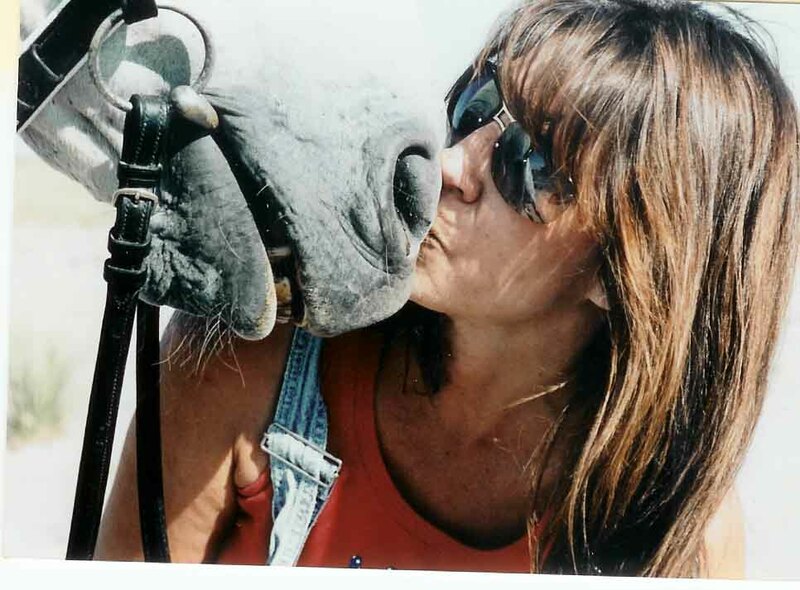 My idea about owning horses had changed I was looking for something magical about them. Once I started looking they began to reveal their true selves to me. And thus my journey into the metaphysical realm exploded. I read and learned everything I could about animal healing and communication. I learned about energy healing and working with crystals and herbs. My world began to expand and I began to remember the forgotten knowledge. It all came very easy to me except on thing. Learning the hard lesson of allowing those beings on this planet to leave this physical plane when they so choose. Death is part of life, the great circle, and I became very versed in how to deal with it. You see the path of the healer, seeker, shaman; whatever you choose to call it is just that “a calling”. It is not for those faint of heart or mind, for those on this path will be tested to their very limits…emotionally. Long story short they were and still are my muse. They keep me writing even now years after they have left the physical plane. They kept and keep me going when things get me blue and down. And they helped me to understand what it was that was so important I had to do with my life. I had to write! I always had a very vivid imagination almost to the point of being gruesome. I have since learned to tune that down. Anyway, I have always been good with telling stories and my favorite teachers were my English teachers. I was also different; I had sensitivity about me. I could feel others pain and emotions, I could easily feel the energies of stones, crystals, trees etc. For me everything was alive and I discovered animism. This can make one’s life unbearable. As my sensitivities developed further, it became harder to live in the “rat-race”. I soon began to dislike people and could not stand to be around most of them…not realizing I was taking on their crap or had the ability to see right into their very core; I could tell a liar a mile away. Once I discovered other people like me, I felt I could be around most of them without it giving me a raging migraine or putting me into a state of depression. The more time I spent with people like me the more my consciousness expanded and that is when the Ah Ha’s began. The pieces of the puzzle of my strange and magical life began to fit together. And so, I began to realize all of the searching, and learning and classes I took began to take shape in the form of a book! I always knew my book was going to be about my three horses but there was something else I was to write about. It took me a few years to figure it out and even after I finished writing the first Dragonhorse I am still trying to understand fully, what it was I wrote! Before I knew that our world was going through another shift in consciousness I would dream about it. Or have visions of things that would be happening to our world. I drove my poor husband nuts with my, in the middle of the night, scenes of natural disasters! I saw them all, earthquakes, floods, fires, they were all in my bedroom. I had no idea what it was about? I pretended that I knew all about it but gladly let him tell ME what he knew. I did manage to tell him that I had a vision I was supposed to be in the mountains versus the front range of Colorado. He agreed with me, since he also lived in the mountains and about five years later did move to the Sangre de Christo mountain range. Okay, so after our most enlightening chat the light bulb went on and more of the forgotten knowledge came flooding back. I was supposed to write about the earth’s Great Shift! I knew my journey was the perfect background story but I wanted to reach the younger people and decided to give my story a fantasy setting, or at least ancient earth; what do we really know about the truths of our origin? So Dragonhorse was born or channeled. I like to think it was channeled by my higher selves, Me and Myself, with I, doing all of the typing. Writing this book did not happen in a year. I had to live and experience this story first and so it is based on over 15 years of my journey into self-discovery and reconnection to the realms of nature. And let me tell you, it was not easy. I tried to leave this path after my first teacher died…I was done, my heart could not take it. But, soon the pain was not as sharp and I agreed to get back on the trail. I really had no choice in the matter; this book was going to be written, even if it happened in my sleep. There was no way I could write another word about what this world of ours had just transitioned into. So I thought I was home free! Right? Wrong. Now I am getting the word that Dragonhorse is a series and I have at least two more books to write. What? No way! I haven’t experienced the world transitioned into the 5th dimension yet! Whew, it’s okay, we are going to write the prequel first. Easy right? Once I settled on that notion I was suddenly bombarded with glimpses of how the story will unfold; I must tell you it is looking pretty darned awesome! See, this is why I love to write, I never know what is going to happen…even if I write out the timeline first, it never happens that way. The characters take on a life of their own. So for me it is like watching a movie unfold in my head and I am just the stenographer! That’s a word right-stenographer? Okay, so since Shion in Dragonhorse had a lot of past life visions…the time when the characters lived way back on the lost world of Lemuria, it made total sense to go there first. Oh and here is the interesting part, I began to get knowledge about the “Hollow Earth” theory. Some call this universe within our earth Agartha! And guess what? Agartha is a gypsy word, and yes my story is intertwined with the gypsy people…another Ah Ha! So see, I am a seeker and finder of the Forgotten Knowledge. Even though I am using the fantasy genre, there is a huge message within my books. If you are willing to expand your conscious and step from our “hell” on earth known as the 3rd dimension and willing to rise up to the 5t dimension, which is happening as I speak, you can become the co-creator of your world, the world in which we truly were meant to live. The world that is already there waiting for us. That is how the characters made it through their “Great Shift”, they were able to raise their conscious and step right into the new world. 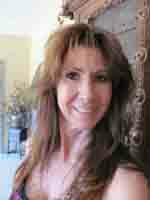 If you would like to know more about me, my likes, and this great transition we are entering, follow my blog on my website. And as I re-remember the forgotten knowledge, I will be posting it for anyone who is open to it. Be sure to check out Denice’s Dragonhorse the Seeker of the Forgotten Knowledge on Amazon or Barnes & Noble! This entry was posted in book tour, books, guest appearances, Guest Blog by Steph. Bookmark the permalink.